Blog Talk - How I Promote My Blog Posts | La Petite Noob | A Toronto-Based Fashion and Lifestyle Blog. 1. Use Social Media Wisely. Promoting your blog and it's contents on social media seems like a no-brainer, but I've learned that it's all about timing. For example, my Twitter links generate the most traffic in the morning so I will tweet the link to my new post as soon as it's published - and always include a photo. Facebook seems to have the most activity in the afternoon, so I'll hold back on posting the link on my page until about 2pm. Pinterest is most active at night - especially on a Friday night - so I stay mindful of that when Pinning my own posts. Instagram is tricky since it does not allow for clickable links anywhere except your profile page. If I'm feeling ambitious, I'll update the link in my profile to direct my following to a specific blog post instead of just my blog. In all cases, don't forget to shorten your link - I alway use Bitly to make the links to specific blog posts short and clean. If you're a lifestyle/fashion blogger, then there's a ton of great communities to post your blog's content to and get inspiration from other amazing bloggers! Stylegawker is a great resource to share your fashion content to. Reddit can have it's positives for sharing blog content as well - I like the subreddit 'Today I Wore.' Chictopia is another great website to post your outfit photos to and then link them back to your original blog posts - bonus points for easily being able to find fashionistas in your area! There are so many platforms and resources out there to share your content with like-minded bloggers, and to get inspired along the way. Commenting on other blogs is a no-brainer, but definitely takes some discipline. When I'm at my most organized, I'll carve out a solid hour and devote it to browsing similar blogs and leaving thoughtful comments that link back to my own blog, or a specific posts that I think they might enjoy. I love reading personalized comments and always click on the link the blogger provided to check out their own site, and sometimes I'll even find myself browsing through the comment sections of my favourite bloggers and clicking on all of the links that people have left - it's a great way to discover other blogs! 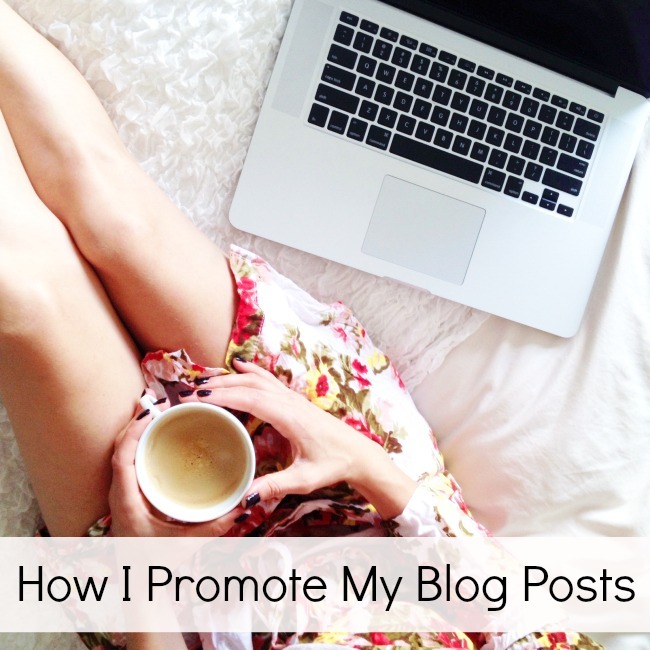 Those are the methods that I use consistently to promote my own blog posts. Do you find yourself using the same methods to promote? What do you do after you hit 'publish' on a post? Let me know! I've only been blogging for a few months and found this article really helpful. It never occurred to me that different social media platforms have ideal times to post. I've just been posting to all of mine at the same time each day. I'll definitely start adjusting when I promote posts now. I'm so glad that you found this helpful Carmen! Isn't Stylegawker awesome Sarah? I love it! Hey girlie! Been meaning to check out your blog for a while now, so I thought today was the day to do it. Great post - thanks for sharing! While I don't use Twitter, I have noticed that timing on Instagram can definitely help, and for myself, I find mornings to be best. I usually comment on other blogs, but have not really tried a forum (never even heard of Stylegawker until now!) -- which sounds like fun, so definitely something to add to my to do list :) Thanks for sharing! I'm so glad that you checked out my blog Agnes, and that you like this post! Let me know how changing the timing of your social media posts works out! Great tips! I didn't know about the subreddit, so I am going to go stalk that now..
Let me know what you think Abby. I haven't visited in awhile, but I remember that it was a huge source of traffic for me when I did! Thank you for this post, it was very interesting. I've only been blogging for a few months and it's always great to find out new ressources and places to promote my post. I just registered to Chictopia & Stylegawker thanks to you ! That's awesome Natacha, I'm glad that you found the post helpful! Thanks for sharing Aline! I love browsing through Lookbook, but have never created an account for myself. Do you find that it drives traffic back to your blog? I'm so glad that you found this post interesting Louise! Hi Lauren! I really love social media, and interacting with readers and fellow bloggers so for me it's fun! For Pinterest my one thought is that if you like it, pin it! Pin your own photos from your blog, as well as what inspires you! Hi Joëlle, I am actually a new blogger. I started this month! So I am still very scared to share my blog with friends and family. I have posted my link on my Instagram account and I do post on Pinterest. But besides those I haven't been promoting too actively, only because I am self conscious! I know you mentioned it took you half a year to open up to your family and friends about your blog. It made me feel better, that I am not alone. But I am becoming more and more open! I am letting more people know that I have a blog and I love all the positive feedback I get back. I am so excited for this journey. I found your blog from YouTube and I have been obsessed ever since! I even stalked your oldest posts lol.